Sunday, glorious Sunday. SmartWool layers, beanie, gloves, audible playing, legs pumping, wind in face, ocean ahead. Slow down for swing with Lindy in the Park. Past the Botanical Gardens (Kew for me), turn around, downhill from here. Long-legged rollerbladers strutting their stuff, grown men playing with toy boats, tatanka roaming unfree. Beach Chalet and the smart casual set. Surfer lost…again. My favorite stretch, riding the raised path along The Great Highway, looking down on wild expanse of Ocean Beach, white caps breaking over human seals waiting for the big one. Pelican formations sail overhead like silent Blue Angels, while sculptured cheeks rush backwards towards me…me. Turn by zoo, animals pouring in two by two. Around Lake Merced, crews rowing, coxswain calling, I know what it’s about, I’ve read The Boys in the Boat. Honking geese as phantom shots bark from dead gun club. Dreams of scarcely clad Ohlones collecting tules. Up the hill, homeward. Thanks Bonnie, I really enjoyed catching that one. Ahhhhh, I do still sorely miss my SF cycling days. You captured what that magic is – perfectly. Thanks Malcolm! Glad you enjoyed it Lisa. I know that if ever I moved away from the Bay Area that ride would be the one I would miss most of all. Lucky you! 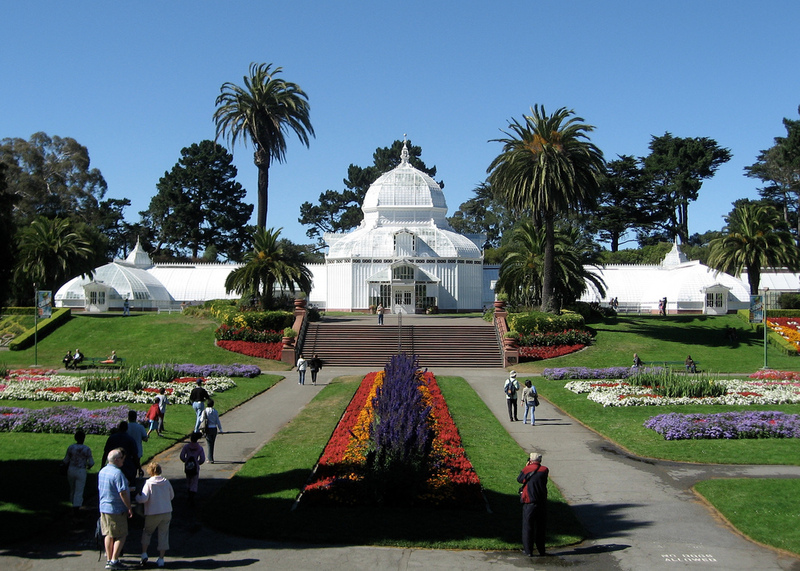 i love San Francisco and have visited the Botanical Gardens and the Beach Chalet. We hope to get back out there to visit this year. Nothing better when the sun is shining there. You captured it quickly with your words as if you were cycling by. Yes, cycling by and trying to see things through Joyce-type eyes. Thanks for the bike ride! I need it after all the homework you give me watching films! Sounds like the perfect day ~ and that much more special on a Sunday. You’ve inspired me for tomorrow. Cheers to your weekend. Thanks Dalo. I should hope you were inspired by someone as today is also also Valentine’s Day! Lovely bike ride, Malcolm. But, did I understand correctly, you ride with and Audible? As a fellow cyclist, I have to note that is very dangerous. I used to ride here in Chicago listening to music and was almost in an accident because I failed to hear the other cyclist. It is against the law here. Otherwise, riding a bike is one of life’s fine pleasures. Thanks Tony. No doubt San Francisco will follow suite in good time as our wonderful city Supervisors are never shy of adding regulations to keep us all safe and well. While I agree that riding a bike while listening to Audible could be dangerous in certain circumstances I don’t think that everything that is risky should be regulated. Regulate everything that is risky and people will assume that all unregulated activities are safe, a recipe for disaster if ever there was one. Thanks, Malcolm. I’m not for regulation, but I am for riding sound-free. Good luck! A beautiful James Joyce quote! !